Famous people born on SEPTEMBER 15 could be the picture of health except for the little problem of their weight. They try to take an optimistic outlook on it but it is very easy for them to tip over the scales at just the thought of food which is discouraging. They need to just stack their kitchen with plenty of alternative snacks and meals. Maintaining good health is a lifestyle change not just a work out for September 15 celebrities. When we talk about their love life, it lacks in the romance department. It would seem that they don’t have much of an imagination when it comes to making love exciting. However, for the right person, famous people born on September 15 are willing to learn how to let go and enjoy the ride. Their friendships are key aspects of their life. They generally have friends that go way back. When they make a friend, it’s for life. Even those that they hadn’t been with in a while, they pick up just where they left off as if it was yesterday. 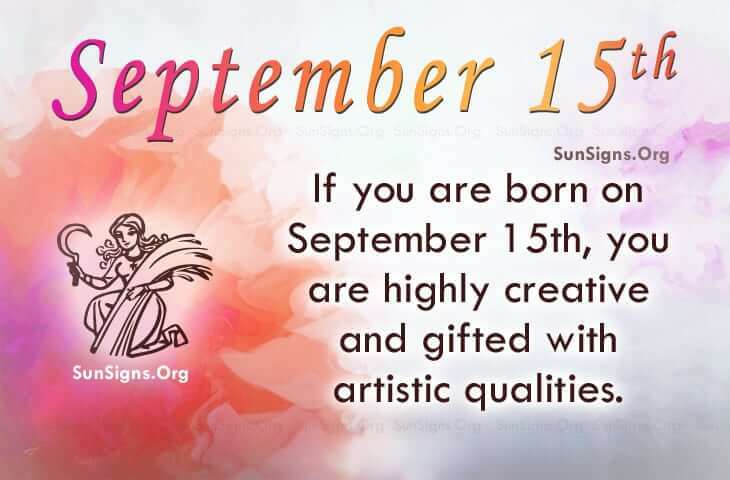 Famous people born on September 15th could be a Virgo who love food but need to watch their calories. Highly creative, they are also gifted with some artistic qualities. However, they are down to earth and loyal to those they love.